You’re invited to join me at a book club tonight and the best part is that you never have to leave the comfort of your stretchy pants and living room. 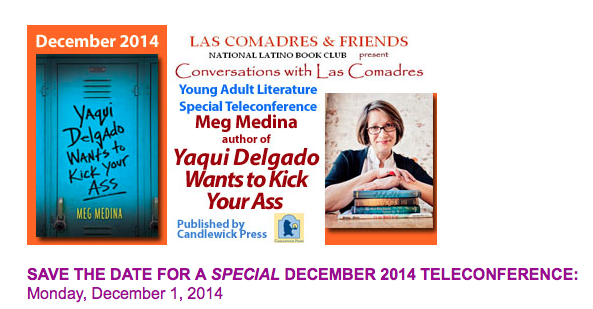 That’s because I’m going to be part of the Las Comadres Young Adult Teleconference Book Club at 8 PM. Anyway, for tonight, founder Nora Comstock is going to lead the conversation about Pura Belpré – the woman and the award that so many people just can’t pronounce – and how I’ve used my year to honor her memory. We’ll also talk on bullying and identity issues, specifically through the Latino lens. (Bean jokes, knife jokes, jail jokes, go-back-where-you-came-from comments…I could go on.) Anyway, I’m thrilled that Dr. Andrea Romero of the University of Arizona and associate editor of Journal of Latino/a Psychology is going to join us, too. I hope you can make it. Check out the upcoming authors, too. I just registered for the Dec. 15 session. The book of the month is The Clairvoyant of Calle Ocho by Anjanette Delgado, which I haven’t read yet, but it also features additional conversation with Daisy Hernandez, whose memoir, A Cup of Water Under My Bed, was one of my favorite reads this year. Looking forward to it.